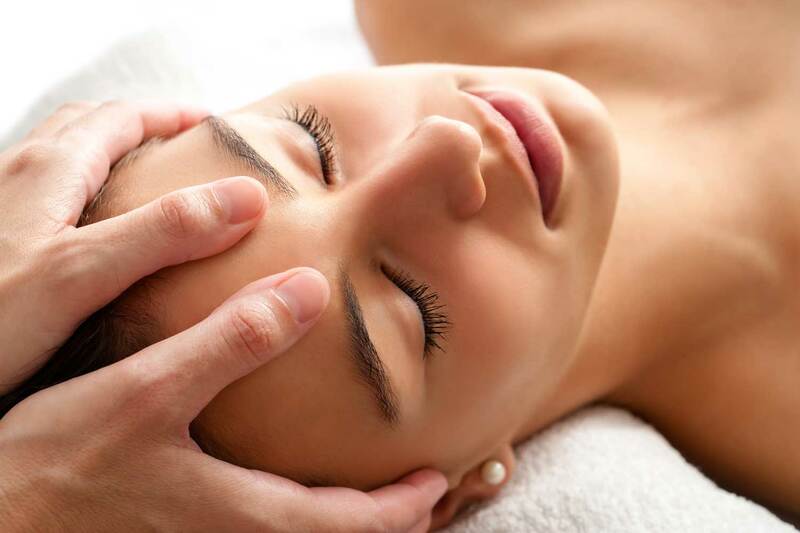 Facial Reflexology aims to relax and help remove stress by assisting the body to heal and rebalance itself. During facial reflexology gentle pressure is applied to the different reflex zones and reflexology points on the face. We believe these points directly relate to areas of the body. Facial reflexology encourages a healthy blood and lymph flow and stimulates Collagen and elastin, therefore, helping your skin to rejuvenate and minimize the appearance of ageing lines. On arrival a short consultation will take place. There is no need to remove clothing except shoes. Whilst relaxing on the treatment couch the treatment begins with a gentle but deep cleansing of the face and neck. Only the best and most gentle organic products are used in the clinic. The carrier oils, such as argon, rose hip, coconut and sweet almond oils are specially blended by our qualified and experienced therapist who will create a special individual blend for you. This is based on your individual skin condition, type and therapeutic needs. If desired, essential oils such as rose, frankincense, orange or mandarin may also be used, creating a specially tailored individual treatment. We do not charge extra for these oils as we consider them to be an essential part of the treatment. If appropriate deep cleansing, exfoliation, hot towels, neck massage and some Indian Head Massage techniques may be added to the treatment. Facial Reflexology works on the principle of following the reflex zones that run throughout our bodies. The Reflexology treatment is combined with a unique face massage that incorporates the most effective natural face-lifting techniques to invigorate every muscle, lift the face and smooth out wrinkles. Special attention is paid to the eyes, cheeks and jawline. During the treatment, the therapist will sometimes use a non-invasive tool such as a roller as well as her fingers, to stimulate the skin and nerve endings. This tool is the only equipment approved by the Association of Reflexologist. Clients frequently regard this as a favourite part of the treatment. It is not unusual to fall asleep whilst receiving facial reflexology treatments and to wake feeling deeply refreshed. Towards the end of the treatment gentle techniques designed to ease you back into the day are used. The therapist will sometimes recommend specific Reflexology Points for you to work on at home. Evidence is beginning to show that stress is one of the root causes of many of today’s illnesses such as depression, tiredness, fertility issues, irritability and poor sleeping patterns which in turn can cause lines and wrinkles on the face. Reflexology to the feet and hands are well known treatments which are accepted as holistic therapies to help to reduce stress and related illnesses. Facial Reflexology which combines the benefits of foot reflexology with the benefits of a holistic facial is thought by many to quickly improve stress related problems, as well as having the added bonus of reducing the appearance of fine lines and wrinkles. It partly accomplishes this by directly releasing muscle tension which helps stimulate collagen and elastin. Pure organic carrier oils are used during the facial reflexology treatment which help your skin to glow. The essential oils added to the carrier oils work on your sense of smell and their antioxidant qualities work to treat your skin and protect it from the harsh effects of the autumn and winter weather, as well as the damaging effects of the summer sun. As the face is closer to our brain than the feet, treatments seems to have a quicker reaction. As our face is the first part of us that people see, it is only natural for us to want to look and feel at our best. I have been treated at East Sussex Osteopaths over the past year and can easily say I highly recommend anyone to go to them for treatment. Using both the osteopaths and the sports massage has sorted me right out.